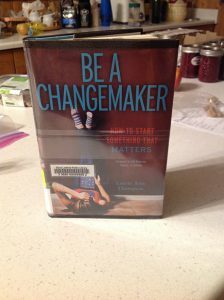 In this third review of books about social enterprise, we’re going to look at a book called Be a Changemaker. This is a young adult book (hence the YA in the library call number) meaning it is written for young people, but I found it so interesting that I would recommend it for anyone who wants to know what a social enterprise is and is wondering about how to start one. The author, Laurie Ann Thomson, has written an informative and inspiring book encouraging young people to not wait, but to do things right now, today, that they see needing to be done. The basic impulse or motivation to start a social enterprise isn’t that different than from other businesses. Someone sees a need that is not being filled and then fills it. Social enterprises often tackle gnarly problems where the solution isn’t necessarily going to make a lot of money, or even any. Still, there’s a need, something has to be done! Social enterprises look for creative solutions to often long-standing problems. It is about more than just throwing money at a problem. Social enterprises strive to find solutions that are sustainable, where doing things pays for itself and can grow. Thomson gives plenty of examples of remarkable projects started by people as young as 11, most under 18 and still in high school. Jessica Markowitz learned from human rights activist Richard Kananga that many children in Kenya were orphaned and could not attend school. She wanted to help, so started out by telling her Grade 6 class about the problem. Working together they came up with a plan to raise money to send to Kenya to help girls pay for school. They didn’t stop there. When Jessica and her friends graduated and went off to other schools, they started doing the same thing there, recruiting other students to help. They called the project “Richard’s Rwanda” after the person who inspired Jessica. It grew to encompass high schools across the country and hundreds of students. After graduating from high school, they started a non-profit organization that continues to encourage students in schools across the U.S. help girls in Rwanda attend school. Or a social enterprise can come about because you have something that you really love to do and do it very well. As a high school student, Christopher Trina used his love for ultimate frisbee, his expertise in the sport, and what he learned about hard work from being part of a frisbee team to start a project raising funds so he and his teammates could travel to Cambodia to teach the sport he loved and life skills he felt he learned from it. Sometimes it’s more a matter of finding a way to finance something you really believe in. Selling a popular product can be a good way to raise money for a good cause. Many commercial products commit a percentage of sales revenue to a good cause. And people working in good causes often use commercial products like bracelets or coffee mugs as a way to raise money to help them with their work. Think Girl Guide cookies! It’s that time of year again. Entrepreneurs and social entrepreneurs aren’t so different from each other. They both want to do things; they are driven by a desire to achieve, but where the entrepreneur might be motivated to help themselves, the social entrepreneur tends to be the type of person who wants to help others. But as we discussed last time, every kind of entrepreneur has to be energetic, organized and able to get others to work for them and with them. Next time, I’ll look at two how-to books, The Startup Checklist, and The $100 Startup, and maybe we’ll learn how hard, or easy, it is to start your very own social enterprise. In the meantime, if you have an idea for a social enterprise, I’d like to hear about it. Sometimes the first step is to tell someone your idea. This article appeared in the Sioux Lookout Bulletin on November 8th, 2017.